Astronomical instruments needed to answer crucial questions, such as the search for Earth-like planets or the way the Universe expands, have come a step closer with the first demonstration at the telescope of a new calibration system for precise spectrographs. The method uses a Nobel Prize-winning technology called a 'laser frequency comb', and is published in this week's issue of Science. "It looks as if we are on the way to fulfil one of astronomers' dreams," says team member Theodor Hänsch, director at the Max Planck Institute for Quantum Optics (MPQ) in Germany. Hänsch, together with John Hall, was awarded the 2005 Nobel Prize in Physics for work including the frequency comb technique. Astronomers use instruments called spectrographs to spread the light from celestial objects into its component colours, or frequencies, in the same way water droplets create a rainbow from sunlight. They can then measure the velocities of stars, galaxies and quasars, search for planets around other stars, or study the expansion of the Universe. A spectrograph must be accurately calibrated so that the frequencies of light can be correctly measured. This is similar to how we need accurate rulers to measure lengths correctly. In the present case, a laser provides a sort of ruler, for measuring colours rather than distances, with an extremely accurate and fine grid. New, extremely precise spectrographs will be needed in experiments planned for the future European Extremely Large Telescope (E-ELT), which is being designed by ESO, the European Southern Observatory. These new spectrographs will need to be calibrated with even more accurate 'rulers'. In fact, they must be accurate to about one part in 30 billions - a feat equivalent to measuring the circumference of the Earth to about a millimetre! "We'll need something beyond what current technology can offer, and that's where the laser frequency comb comes in. It is worth recalling that the kind of precision required, 1 cm/s, corresponds, on the focal plane of a typical high-resolution spectrograph, to a shift of a few tenths of a nanometre, that is, the size of some molecules," explains PhD student and team member Constanza Araujo-Hauck from ESO. The new calibration technique comes from the combination of astronomy and quantum optics, in a collaboration between researchers at ESO and the Max Planck Institute for Quantum Optics. It uses ultra-short pulses of laser light to create a 'frequency comb' - light at many frequencies separated by a constant interval - to create just the kind of precise 'ruler' needed to calibrate a spectrograph. 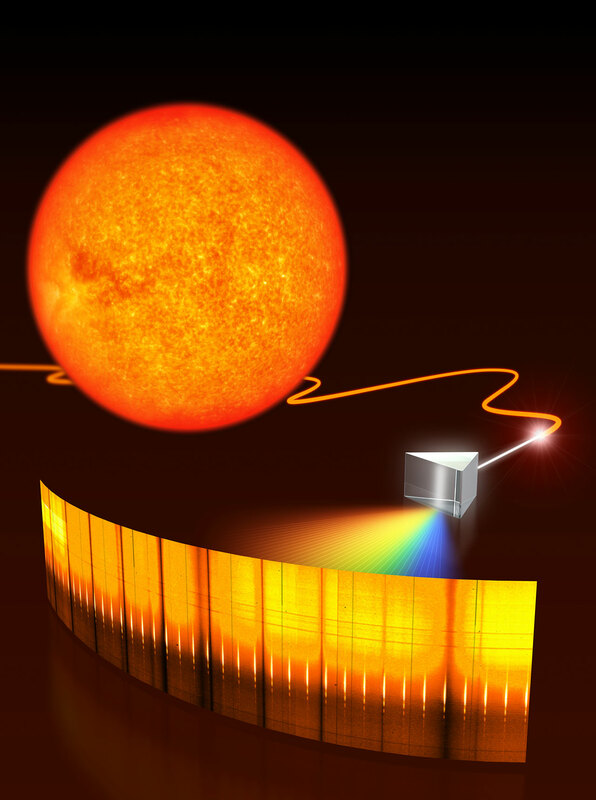 After successful tests in the MPQ laboratory in 2007, the team have successfully tested a prototype device using the laser comb at the VTT (Vacuum Tower Telescope) solar telescope in Tenerife, on 8 March 2008, measuring the spectrum of the Sun in infrared light. The results are already impressive, and the technique promises to achieve the accuracy needed to study these big astronomical questions. "In our tests in Tenerife, we have already achieved beyond state-of-the-art accuracy. Now we are going to make the system more versatile, and develop it even further," says team member Tilo Steinmetz, from Menlo Systems GmbH, a spin-off company from the Max Planck Institute, which was founded to commercialise the frequency comb technique. Having tested the technique on a solar telescope, a new version of the system is now being built for the HARPS planet-finder instrument on ESO's 3.6-metre telescope at La Silla in Chile, before being considered for future generations of instruments. One of the ambitious project to be realised with the E-ELT, called CODEX, aims to measure the recently discovered acceleration of the universe directly, by following the velocities of distant galaxies and quasars over a 20-year period. This would let astronomers test Einstein's general relativity and the nature of the recently discovered, and mysterious, dark energy. "We have to measure the movement of these distant galaxies to a few centimetres per second, and follow this over decades. These speeds are barely faster than a snail's pace, and the laser frequency comb is absolutely crucial for this," says team member Antonio Manescau, from ESO. Astronomers also use spectrographs to hunt for planets around other stars, by watching for subtle movements of the star as the planet orbits it. To be detected with current technology, these planets must be relatively massive or close to the star, compared to Earth. A more precise spectrograph will let astronomers find planets, with characteristics similar to Earth's. The team is composed of Constanza Araujo-Hauck, Antonio Manescau, Luca Pasquini, Hans Dekker, and Sandro D'Odorico (ESO), Thomas Udem, Tobias Wilken, and Theodor Hänsch, (Max-Planck Institute for Quantum Optics, Germany), Ronald Holzwarth and Tilo Steinmetz (Menlo Systems GmbH), Michael Murphy (Swinburne University, Victoria, Australia), Thomas Kentischer and Wolfgang Schmidt (the Kiepenheuer Institute for Solar Physics, Freiburg, Germany). The Vacuum Tower Telescope (VTT) is operated by the Kiepenheuer Institute for Solar Physics, Freiburg, Germany. The scientists used a solar telescope as this allows them to have access to a very high-resolution spectrograph. The astronomers made also use of the TIP II instrument from the Instituto de Astrofisica de Canarias, whose staff greatly helped. More information on the 2005 Nobel Prize in Physics is available on the Nobel Prize page. A description of the laser frequency comb project is available in an article in the ESO Messenger (volume 129, page 24).